Stone,steels,weld tube and so on large objects. (1)Wound type of product :Ribbon wound steel strapping and oscillated wound steel Strapping. (2)Surface of product: Blue-oiled steel strapping and blue-waxed steel strapping. 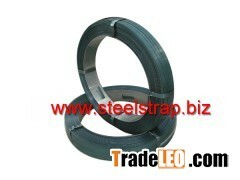 Tips：This page [Blue tempered steel strapping] infomation provided by [Lingyun Steel Strapping Limited.] ,the enterprise is responsible for the authenticity, accuracy and validity of the information content. www.tradeleo.com do not assume any guarantee of joint and several liability. A safe way to suggest that the two sides trade, to ensure the interests of both sides.